With Christmas only a few weeks away, it might be interesting to see some photos of how the festive season was celebrated in the Third Reich. Here is a picture of Goebbels at a function where 500 gifts were given to Berlin children, 1936. 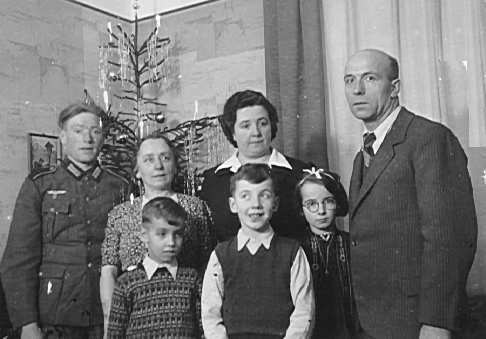 Here is the "Weihnachtsmann" in Heibronn in 1938. Some Xmas photos from IR36 album. No 3 is the best one yet. Keeping the thread going....here's a couple of strange Xmas photos from another album of mine showing soldiers from a KM shore-based unit building a Xmas altar from kid's toys. My guess is that the soldiers made the toys and will probably give them away. Last edited by Larrister on 02 Dec 2004 14:30, edited 1 time in total. Another Xmas in the Barracks from ebay.